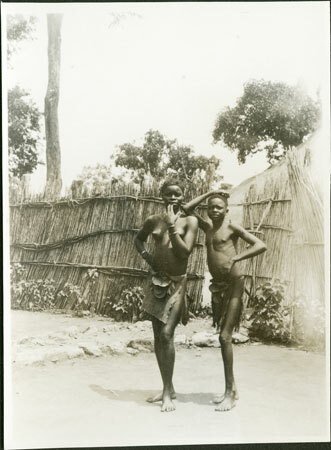 Two young females outside a homestead, possibly in a posed position. They are wearing a girdle of leaves tied before and behind, as well as a piece of barkcloth as an apron (agbaya). Notes on card mount m/s pencil - "severe rcs 6/87"
Morton, Chris. "Zande girls" Southern Sudan Project (in development). 03 Jan. 2006. Pitt Rivers Museum. <http://southernsudan.prm.ox.ac.uk/details/1998.341.372.2/>.